Baby orangutans have four dexterous limbs. 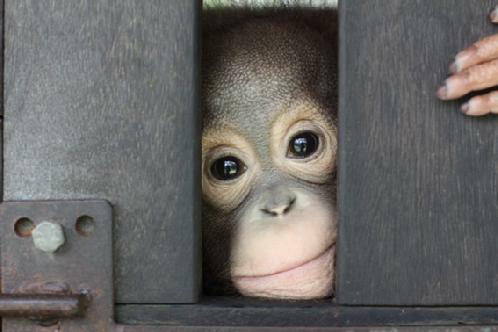 I know this because within moments of entering the orphan "pondok" at the Orangutan Care centre, in Southern Borneo. I had young primates climbing up my legs, crawling over my back and grabbing my camera. Their favourite method of identifying me was to twist my hair around their fingers and remove it from my scalp. No wonder volunteers are not normally allowed any direct contact with the orangutans. I was there at the invitation of Sai Kung resident Mara McCaffery, who founded the Orangutan Aid society in Hong Kong in 2009 to raise money for the centre. She fell under the orangutans' spell after visiting Borneo in 1996. "Man's greed and inhumanity are the fundamental reasons that orangutans are on the brink of extinction, bit it is also within our power to save them" she says. She spends a month each year at the centre in Kalimantan, Indonesian Borneo, supplying hands on care to the orphaned orangutans, delivering funds and making sure the money raised is put to best use. I went with her to take pictures for the Orangutan Aid website, allowing me privileged access to the young orangutans.